Wondering how Vegas Fiesta Casino brings the Strip to your home? We introduce to you the spirit of Vegas, in a one-stop online casino destination. With stellar graphics and unique offerings, we delve further to see what this brand can bring to the table. Vegas Fiesta Casino is a fresh iGaming brand, having recently been established in 2016 and as such has quite a lot to offer the market. We've had a look at all the information available to see if they're on the right track and although we can draw some conclusions, only time will tell if they've made the right moves since then. Vegas Fiesta is licensed by the gaming authorities in Curacao which gives them license to trade in various countries on a global scale. From what we've gathered, it seems they are already gaining popularity in several European countries as well as Canada. It would thus make sense that along with English, they also allow for their site to be translated in French. It's not easy making a name for yourself in the iGaming market, an oversaturated industry with so many casinos that have the funds and knowhow to provide everything their customers desire. Vegas Fiesta Online Casino has quite a battle ahead of them but so far things are looking good. Vegas Fiesta's gaming options stem from a single entity software developer named Rival. Rival Gaming has been around since 2005 and is considered to be one of the industry leaders in software development. With that said, they have an arsenal of over 160 casino games that are available to play online as well as on mobile. What's interesting to note is that the company is responsible for introducing a new concept called i-Slots which is prevalent among the use of mass gaming community. i-Slots are structured to regular video slots with the addition of having a story incorporated into its platform. Players will spin the reels as usual and depending on the results, will progress through the story in a positive or negative manner. Further to this, all titles at Vegas Fiesta games section are available to download to your desktop or to play online or via a mobile device. Since they were developed with mobile in mind, there should be no performance issues and they should function on all latest Android and iOS devices. First in line are the slot games which include classic slots, video slots, progressive jackpot slots as well as Rival's unique i-Slots. There are 26 traditional slot games available with another 23 i-Slots. This may not be the hundreds boasted by some online casinos but should still be more than enough to keep you playing for quite some time. Some of Rival's most popular slot games can be found at Vegas Fiesta. There are also several table games available with a few versions of Blackjack, Roulette, Craps, Poker, Red Dog, Baccarat and Pai Gow. The table games list is limited to 12 games only. Furthermore, you'll find some popular variants of Video Poker such as Jacks of Better, Tens of Better, Joker Poker, Aces & Faces and Double Joker. There are also a few specialty games including Soduko and 2 versions of Keno. All games have a free play option available for those who prefer to test games and learn all the ins and outs before putting their money down. Be aware that the loading time for games is rather long which is strange because the games tested didn't contain extraordinary graphics that should slow down the loading process. When loading a game, we were presented with one loading screen after another and only after finishing the 8th was the game finally open. This could be a problem on the web development side and we'd advise Vegas Fiesta online casino to look into the matter. The game options are very limited at Vegas Fiesta which is why most online casinos opt for a few software providers. Those who do use just one provider normally go for a larger company like NetEnt or Microgaming who have a more extensive number of games at their disposal. However, the quality of the games seem fair and the introduction of the i-Slots concept should provide ample entertainment. Being a brand new casino it wasn't possible for us to find any outstanding complaints against Vegas Fiesta Casino online so it's uncertain just how well they handle their support. Their lack of experience definitely counts against them but then again, it's usually the smaller companies that make an extra effort with their clients because they know just how valuable each one is. The support options offered from their site are decent though, including an expansive FAQ section that contains a lot of information. The FAQ list can say quite a lot about the effort a company is willing to put into their customer support and in the case of Vegas Fiesta it says that they are willing to go the extra mile. Their FAQ section is broken down into several categories to make finding the right answer easier. These categories include Installation, Registration, Logging in, Deposits and Withdrawals, Start Playing, Security, Customer Service, Legal Aspects and Promotions and Bonuses. Most common queries should find an answer in this section as the answers to the various questions are well versed and easily understandable. For those who still have further queries or who prefer to simply speak to a customer support representative there are also the options for live chat and email support. Support is available 24/7 for live chat but at the time of writing, no phone support was available. While the lack of phone support is notable, many larger online casinos don't bother with phone support either since most players prefer the live chat feature anyway, so this is not a huge concern. As you may expect, Vegas Fiesta Casino is still in search of many new players to sign up and start playing. To make their establishment more attractive they've included various special promotions to benefit new and existing players. We'll start with the great package which is available for all new players who register an account and can enjoy Vegas Fiesta Casino welcome bonus. After a first deposit of at least £25 is made the player will receive a deposit bonus of 300% their deposit amount. This bonus goes all the way up to £1,000. This means that you only need to deposit £333.33 in order to receive the full £1000 bonus, leaving you with a starting capital of £1333.33. This rather phenomenal deposit bonus doesn't just span across the first deposit but also the second and third. While many online casinos offer a deposit bonus for the first few deposits, most of them lower the bonus amount with every successive deposit. This is not the case with Vegas Fiesta and you'll receive the same 300% bonus for each deposit, giving you a potential starting bonus of £3000. Furthermore, once the first deposit is made, players will also receive 20 free spins every day for the first 20 days. These spins can be used at any slot game on offer. Finally we have to get to the wagering requirement which is generally the less positive point with bonus offers. A wagering requirement is a minimum amount that has to be wagered before the bonus funds may be withdrawn. The average with most online casinos is around 40x the bonus amount, which as you can imagine is rather difficult to complete. Vegas Fiesta doesn't have a 40x wager requirement but only a 1x wager requirement. It's important to note that once you are able to withdraw funds, you may only withdraw a maximum of 5 times the bonus amount at a time. Given all these factors, the welcome bonus at Vegas Fiesta Casino is truly spectacular and we suspect it'll bring them many a new player in the time to come. As an additional deposit bonus for existing players, any deposit of £100 or more will qualify you for the 100% cashback bonus. This means that if you wager those funds and win, then great, but if you lose then you will be credited the entire amount, no questions asked. Although it is not specified on their site, we suspect that this is only for initial deposits from new players. Next we come to the 10% refund offer exclusively available to members of their VIP club. If you are part of the VIP club then you will receive 10% of any deposits made back at the end of every month. Vegas Fiesta has a loyalty program to award long time player. As you play, you'll earn loyalty points which may be used at their online store to purchase prizes ranging from tablets all the way to luxury cruises and holidays. They don't offer any details on how the points are earned or if certain games offer a higher earning than others. Vegas Fiesta hosts weekly tournaments which are available to all players. Opt in to a tournament of your choice and you can battle it out with other players. While there are various prizes available for each tournament, the grand prize is usually £20,000. Vegas Fiesta Specifies a daily happy hour during which time all deposits will receive a 400% bonus which is nearly unheard of in the industry. Vegas Fiesta already have a number of payment options available from their site such as Paysafe Card, POLi, Skrill, Ukash, Visa, Maestro and Neteller. While some other popular methods are missing, we suspect they should be added soon. According to the terms of service a withdrawal can be requested at any time but may take 7-18 business days to approve which is outlandish. Additionally, withdrawals through any payment method are subject to a fee ranging from £10 to £40. Withdrawals have a minimum and maximum limit of £100 and £250 respectively. Considering that a withdrawal of £100 may cost you £40 in fees, you'll end up losing 40% of your funds. These conditions are highly questionable and we suspect they won't stay in place very long if Vegas Fiesta plans on keeping their client base happy. Players who have been absent for a while but still have a positive balance in their account will receive a reminder from Vegas Fiesta to let them know that they can still claim those funds. The environment created by Vegas Fiesta is quite a pleasant one. Opening the home page will greet you with a sparkling scene of Las Vegas in the evening. This kind of city life theme is being utilized by more and more online casinos and it seems to work well for them. The rest of the site is built on a plain, dark background to let the features of the page stand out more. 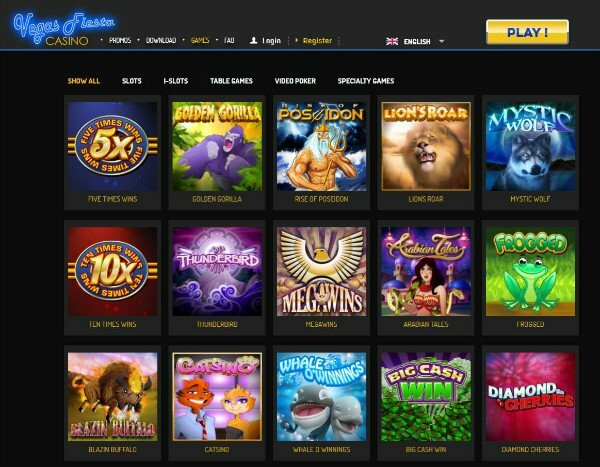 The home page provides you with a bunch of the most popular games in a tile format, along with the current progressive jackpot and a list of the latest winners across the board. The bottom of the page provides you with some information on Vegas Fiesta and lists all their affiliates. The top is where you'll find the Vegas Fiesta logo under the moonlight along with the basic navigation bar and the option to register or log in. To the bottom left you'll find a live support button, should you require any assistance. The promotions page presents you with all the promotions as large tiles, each with its own profile picture. Selecting a promotion will provide you with some additional information although in some cases, not enough for you to fully comprehend how they work. There are also a few spelling errors and discrepancies which could actually be rather dangerous. The weekly tournament bonus actually lists that the 1st prize is both £20,000 and £200,000 with no way to determine which is the correct amount. These are minor details but could cause some great confusion and should have been corrected before making the site live. The games page is simple and user friendly. 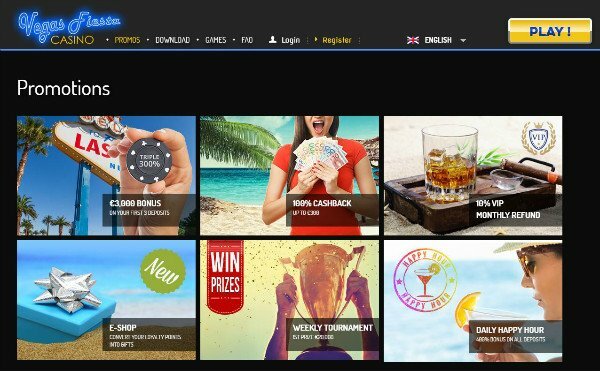 The usual tile format is used to present the games and you can sort them according the following categories, Show All, Slots, I-Slots, Table Games, Video Poker, Specialty Games. All games in the various categories are displayed at once but since the game selection is rather limited, this doesn't pose a problem. The lack of language options is notable but English and French should be enough to cater for their initial target audience. Even though most of the pages use the basic black theme with very little in terms of garnish, you'll always see the neon blue Vegas Fiesta Casino sign at the top which does a good job in brightening things up. Vegas Fiesta Casino is off to a good start but still have a long way to go before they will be considered a serious contender, as things stand now, their future is still a delicate balancing act. While they have some good games available, the addition of more software providers will enhance the entertainment experience for all players. Customer service seems to be decent, although it's difficult to confirm how they handle customer queries since there are almost no external reviews available. The FAQ section is quite extensive though which does show a willingness to put some effort into customer assistance. Furthermore, customer support is available 24/7, which is not always possible for a new establishment such as this so that has us rather impressed. The various grammar errors and lack of information on their website is a notable black mark and we can only hope that these will be corrected in due time. The biggest high point at vegasfiesta.com must be the incredible welcome bonus. While the other special promotions are good, the welcome bonus stands head and shoulders above the rest with its 3 x 300% deposit bonus and 1x wagering requirement. There is a very big negative however, and that's the terms surrounding withdrawals. A maximum of £250 may be withdrawn at a time and any such requests will take up to 18 working days to approve and may cost you up to £40 in fees. This is really unacceptable as it seems like they are deliberately trying to prevent players from withdrawing any funds. It doesn't help offering players a £3000 potential welcome bonus if they can't even withdraw 10% of that amount at a time and they might end up paying a large portion of that in fees. So far it's difficult to put a positive or negative verdict on this review, it would seem that things are hovering around the middle. If Vegas Fiesta takes note then they might be able to correct these problems which should help them secure a solid future.